The second volume in Papercutz’ series of Disney Graphic Novels is out. 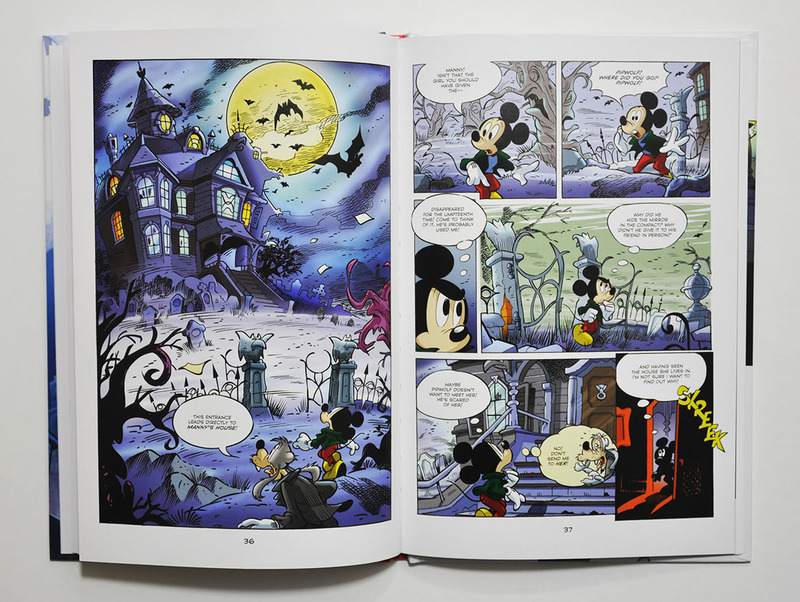 Even if the series title and volume numbers are not written on the cover or spine, the editorial page inside made sure to point out that series is called "Disney Graphic Novels", and that this is #2. That’s also how they are titled and numbered on online bookstores. The first volume was a comic adaptation of the movie Planes, and I wrote a short blogpost about that one last year. The second volume is titled X-Mickey: In the Morror and contains stories from the first volume of an Italian series of X-Mickey comics. Originally this series ran for 30 issues in Italy from 2002 to 2004. But part of the series has been translated and published in lots of different countries. In fact it’s not even the first time it’s published in English. The English translation was first available for in-app purchase in a Disney Comics app for iOS (not sure if this is still available), and then they were added to comiXology. Currently there are 8 digital issues for sale on comiXology, I’m not sure if more stories were/are available from the iOS app but I doubt that is the case. So the digital English translated comics are far from complete. At least the official ones, I have seen scanlations (fan translated comics) of this series floating around the net. Looking at the preview pages on comiXology, it looks like that is the same translation as used in Papercutz book. 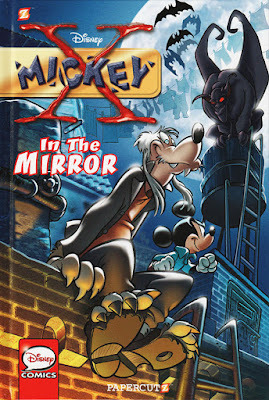 Inside "X-Mickey: Inside the Mirror"
X-Mickey is sort of a spooky horror inspired series, but there’s also a lot of humor. In it we find Mickey traveling through portals to another dimension and meeting new characters that are special for this series. Most notable is the Goofy-lookalike werewolf named Pipwolf, but we also have Manny that looks like an albino Minnie and several other characters that are recurring throughout the series. X-Mickey used to run in the Norwegian monthly Mickey Mouse comic (not published anymore), so I’ve read a good deal of the stories – but not all. 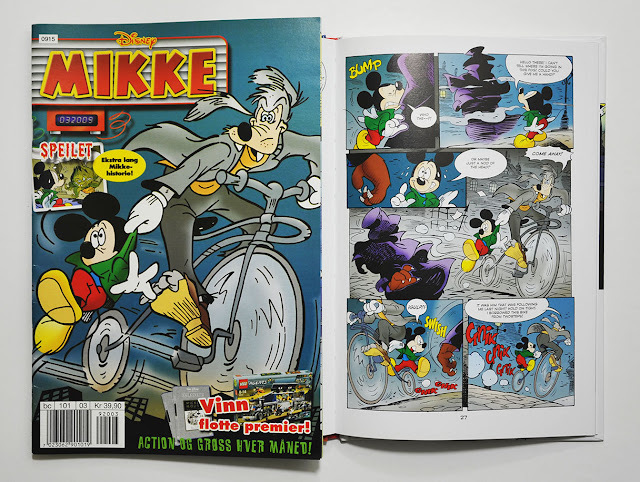 In the Norwegian issues the stories were not printed in the chronological (Italian) order, they were often cut and the issues featuring X-Mickey also had other "classic" Mickey stories. And instead of using the original great cover art, they made new covers by using art from the stories. So the stories were not presented in a good way, and at first I didn’t like the series at all! I thought it was weird looking and far from the same as the Mickey stories I grew up loving. But after reading a bunch of stories and getting to know the characters and universe I started to like the series more and more. You just have to think of this as a separate series from the other Mickey-stories and not get too caught up in canon and continuity and stuff. Now I actually look forward to reading this series in English. From the vague talk in the editorial page in vol.2, it sounds like they are planning more issues with X-Mickey. If they do I really hope they keep to the original Italian order, and publish the volumes as complete as possible. Unfortunately only two of three stories from the Italian #1 (or #1000 actually – the original numbering went from #1000, #999… to #971) are printed in the first Papercutz issue. The supporting stories are not as interesting as the main ones, but I would still like to read them. The future of Papercutz’ "Disney Graphic Novels"
Two more issues are announced for this year. 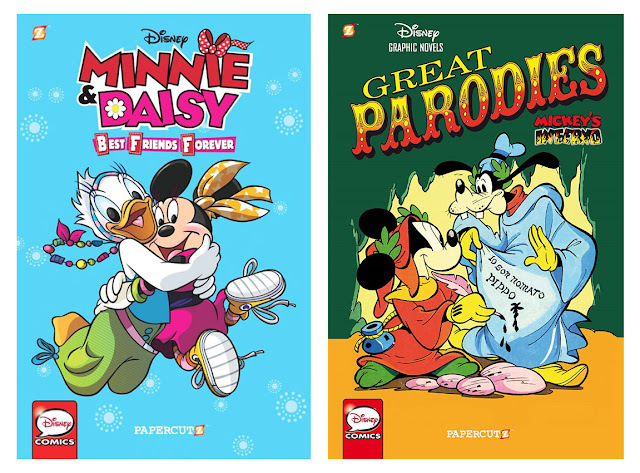 Vol.3 will be Minnie & Daisy: Best Friends Forever, scheduled for July – and vol.4 will be Great Parodies: Mickey's Inferno, scheduled for December. The one I’m really curious about and that might be good news for Disney comic fans is Mickey's Inferno! Gemstone already printed a remounted and cut version of this story in Walt Disney's Comics and Stories #666. I also got two different Italian prints, but they I can’t read without serious dictionary help. So I’ve wanted an uncut, uncensored and original layout version that I can read for a long time! And Amazon currently list that the book will be 88 pages, so that sounds promising. I’m also curious if this print will get a new translation. The story is written in rhymes and is not easy to translate, but Dwight R. Decker did a great job for the Gemstone print I think. Ok, so this series has now published in the USA. It's cool and in Germany, it has become a cult. But I prefere "Mickey Mouse Mystery Magazine", which has also published in the german "Lustiges Taschenbuch Premium". "Mickey Mouse Mystery Magazine" would be interesting to see in English. I haven’t read this series, only seen some samples – but from what I’ve seen of the style and coloring it’s a typical series that would look a lot better on proper paper and not on the cheap paper the Lustiges Taschenbuchs usually use. Also it’s not that long a series compared to X-Mickey. With Papercutz’ current schedule with 3 books a year, one being X-Mickey – it would take 30 years to finish the series. I don’t really see that happening. In the "Lutiges Taschenbuch Premium" every year come three Numbers. the first is reserved for PKNA, the second for MMMM and the thrd for Micky X. But sorry, we're not here to speak about german comic books, we're here to speak about american Comicbooks! Hex: since you are more familiar than me with the work of Al Taliaferro (as you did a few posts about him in the past), I have an off-topic question for you. In an Inducks review of "Donald's Grandma Duck" by Craig/Barks, we can read: "very first depiction of the farm (only talked about in the Taliaferro strips)". Is there actually a Taliaferro strip where the farm is mentioned before its debut in the comic books? Well, when Donald goes to visit his cousin Gus in "Pumpkin Center", in the strips from November 7, 1938 to November 19, 1938, Gus works at a farm. But if that is Grandma Ducks farm is unclear. It’s probably Aunt Fanny’s farm. In the 3rd strip with Grandma Duck (September 29, 1943) she says that she is living on a farm. But I we don’t actually see the farm in the newspaper strips before the comic books. "Well, when Donald goes to visit his cousin Gus in "Pumpkin Center", in the strips from November 7, 1938 to November 19, 1938, Gus works at a farm": yes, I aleady knew that. "But if that is Grandma Ducks farm is unclear": I guess it's not, since Grandma Duck hadn't been created yet in 1938, and since the idea of pairing Grandma Duck and Gus was only used in the comic books from 1950 onwards (though I don't know if the first story was "Donald's Grandma Duck" from July 1950 or "Grandma Duck, Homespun Detective" from an unknown month of 1950; I don't even know if the farm appears in the latter). "It’s probably Aunt Fanny’s farm": I guess so, even though we don't see Gus' parents in these strips. "In the 3rd strip with Grandma Duck (September 29, 1943) she says that she is living on a farm. But I we don’t actually see the farm in the newspaper strips before the comic books": so the farm is already mentioned in her third strip? That's all I wanted to know, thanks for the information: now I checked the scan an Indcks and saw the panel where Grandma Duck talks about hef farm. I wonder if the farm is also mentioned in later strips. Snce Grandma Duck was based on Taliaferro's mother-in-law, Donnie M. Wheaton, do we know if she also lived on a farm? And do we know if is true that, as I often read, Taliferro had an aunt named Della like the mother of Huey, Dewey and Louie? A few other questions about the work of Taliaferro: beside the "Grandma Duck" from "The Wise Little Hen", is Donald's grandmother ever called Grandma Duck in the newspper strips, or is she only called "grandma"? And about Huey, Dewey and Louie: is their surname ever mentioned? I know Barks used the surname Duck in the ten-page "High-wire Daredevils", the same that introduced the name Duckburg (W WDC 49-02, October 1942) and reused it in later stories; hovewer, I'd like to know if the surname Duck for Donald's nephews was ever used in any media that predates "High-wire Daredevils". I'm not sure about Grandma or the boys being called "Duck" in early newspaper strips. I'll be reading the first years of Donald Sunday pages soon (the first IDW volume collecting them are in the mail). And I'll be reading all the first Grandma strips this summer when the 3rd book in IDW's daily strip collection is out. I'll keep this in mind when reading them. Thank you for the answer. But there's also a question that I forgot in my previous message: I have read in a TV Tropes page that "In a 1940s Donald Duck newspaper strip, Donald applies for child benefit as the sole guardian of Huey, Dewey, and Louie". I know that Donald listed the boys as adopted in the short "The New Spirit" (1942), and I'd like to know if there is also a Taliferro strip that shows that. "And I'll be reading all the first Grandma strips this summer when the 3rd book in IDW's daily strip collection is out. I'll keep this in mind when reading them": I am counting on you. :-) By the way, how often these IDW's daily strip collection books are published? Unfortunately, the image on Inducks is too small to read. Do you have Walt Disney's Comics and Stories #114 (March 1950), which has the only American reprint of the strip? And if you (or anyone here) has it, what does the last panel of the strip say? Instead of continuing this off-topic discussion here, I made another post about this strip. This blog is mostly following and talking about American Disney comics, but might have an occasional post about Disney comics not available in English too. I won't do many reviews in the traditional way, but talk about things I find interesting or want to share.